Jed Appleton has hustled to get himself heard. Whether he actually has been promoted to play, got himself a gig, or he just sets up on the street, this musical minstrel is on a mission. Playing over 100 gigs last year and going through five different suitcases lugging an amp around, Jed’s mentors infused in him inspiration to make music not for monetary gain but personal pleasure. 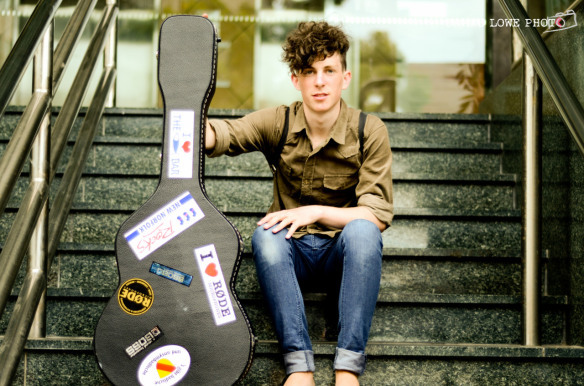 By plane, train or tram, by bus or just by busking, Jed’s motivation for music is taking him places. He recorded his debut album, “Beautiful One,” in his bedroom using just one microphone and one person to produce, record and master his music: himself. Despite doing it all on his own, the album reached #19 for Australian iTunes singer/songwriter albums. His latest song, “Happiness,” which he released for free, hit #8 on the Indie Charts and # 51 on the Overall. After three years of constant campaigning and collecting any kind of supporting show he could secure to get his music heard, Jed has laddered up the local music scene. In March 2012 his persistent passion paid off when he procured his first headlining show. An all-ages affair, there were around 150 people in the audience. A skilled songwriter, singer and guitarist, in September Jed made it through to The X Factor Australia’s “boot camp” stage but what with forgetting lyrics and not liking the songs he says he “won’t make the same mistake again, but I had the time of my life at the same time.” Refueled from the foundation of fans and the foothold he found, Jed’s second EP, “Comforts Flow,” comes out in November. He will be playing some planned shows, but also, getting back to his grassroots groove, he will still be busking with his band, Jed Appleton & The Quartet – Jed Appleton – Acoustic/Lead Vocals, Hugh Foley – Banjo, Steven Morris – Keyboard, Callum Jubb – Double bass, and Kathryn Dimond – Drums/other percussion. You can currently see them in concert on the Tasmanian Tour, including Saturday October 13th at the Royal Oak Hotel in Launceston, Sunday October 14th at the Tapas Lounge Bar in Devonport, and Wednesday October 17th at the Republic Bar in Hobart. Consistently climbing the music ladder, Jed is getting closer to reaching his goals. No matter where you see him – in a bar with a band or solo in the street, Jed’s doing everything he can to reach his destination. Whether he arrives by bus or by plane, by train, tram, or some other track of public transportation, no matter where he’s playing a show to get your support, Jed is the kind of candidate that gets my vote! Sara Fincham: You said that you’ve learned a lot from busking. What are the benefits? Jed Appleton: I wouldn’t be where I was without the help from busking, mainly financial, but probably more so the enjoyment, and keeps me happy. I love playing to people. SF: From what I understand you’re pretty self-reliant it seems when it comes to making music. You haven’t really had a lot of help. Is that accurate? You’ve had some music mentors? Anything or anybody else that has allowed you to do this? JA: Well, I do find myself taking on challenges all the time. It’s the most amazing learning curve I can ever have. I get so much help from some of the older musicians and managers, such as Dario Phillips who helps me manage myself and keeps me pretty motivated even though he wouldn’t know that. Knowing that the older bands are doing what I want to do, makes me want to do it more! Also, my mother helps me incredibly to stay grounded. SF: Where does your musical motivation come from? People make music for a lot of different reasons – what’s yours? JA: I make music mainly to enjoy my life. I don’t want a boring dead end job, and I would rather put 100% into my music career. SF: Was it a bit of a challenge to make your way into the local music scene? Were there any kind of obstacles you had to overcome – your age, etc? JA: My age has never really been a huge factor, and people in the industry are usually surprised about how young I am, but it doesn’t phase me. I know I’m young, so I’m always open to what the older, experienced musicians have to say. They all let me in, regularly getting support acts for the bigger local bands. SF: How did your first headlining show feel? Was it just a sense of accomplishment if nobody would have showed up to see you, and how did it feel to have so much support? JA: My first headlining show was in fact my EP launch at the Youth Arc. It was the most amazing feeling. The place was packed, and everyone was so silent and they payed so much attention. I was overwhelmed. SF: How is your second EP progressing? Is it still due out in November? Were there any differences in doing this one? JA: The new EP, “Comforts Flow,” is coming along very nice, we record next week with the full band. It is coming out on the 23rd of November, and I can’t wait to show people the new sound. I would say it’s more folky. More harmonies, more drums, percussion, and better lyrics. SF: What does the band bring to your albums, your live shows? JA: The band brings a much more ‘structured’ sound. When I played solo, I did whatever I wanted, and could go to whatever song I felt like. Now it’s a lot more structured, it has made me want to write better songs, and find a more interesting sound. SF: The important life-on-the-road-lesson – how is your luggage situation these days? What other wisdom can you share with us from your type of touring? JA: Well, I had no luck when I toured the mainland last time. I went through 5 suitcases, and probably injured my back! I learned a lot from that trip. Trains are crazy stressful, and never catch a Sydney bus, trams in Melbourne are the hardest things to get off with a suitcase/guitar/microphone stand. In seriousness, a van is probably very wise, or just don’t take busking equipment with you and 500 CDs. Buy a solid suitcase if so. Planes are awesome, cheap and reliable to travel when you’re solo. Keep making friends or you will be lonely, and feel alone, and trust your friends.